There are some who say a robot apocalypse is just fear mongering. ‘Humans will control the robots,’ you say. Wait till you see this. 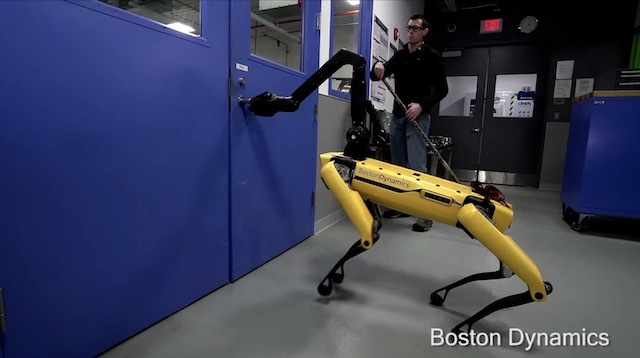 Last week Boston Dynamics showed the SpotMini robot dog opening a door. Now, the company has shown what happens when you try to stop the SpotMini from doing so. You simply can’t. The researcher working with the SpotMini tried to halt its progress with an ice hockey stick, and also tried to pull the robot back with a leash. During this fitting demonstration of robustness, a panel from the SpotMini breaks and falls away, but the robot simply kicks it away and continues jostling with the researcher. After our human gives up, it walks towards the door and opens it to go through. And I say, yeah sure. Tell that to the dog when he is using its arm to choke you in few years.